A lead in a marketing context, is a potential sales contact, an individual or organization that expresses an interest in your products or services. Leads are typically captured through the referral of an existing customer, or direct through the company website (Using web-to-lead), etc. Usually, leads are converted when they have been identified as qualified sales prospects. During conversion, the information from the standard lead fields appears in standard fields for contact, account, and opportunity records. A lead source is mapped to contact and opportunity lead source. It means the standard Lead Source field on the Lead object is not mapped automatically to the Account Source field on the Account object when converting a lead. Let’s start with a business use case. Pamela Kline is working as System administrator at Universal Containers (UC). She has received a requirement a to auto populate Account Source field on Account object from Lead Source field on the Lead object when converting a lead. 3. The next task is to add Process Criteria, To do this click on Add Criteria, enter Name, Type of action and set filter conditions (In this case set [Lead].IsConverted Equals Boolean True as shown in the following screenshot. Once you are done, click on the Convert button. 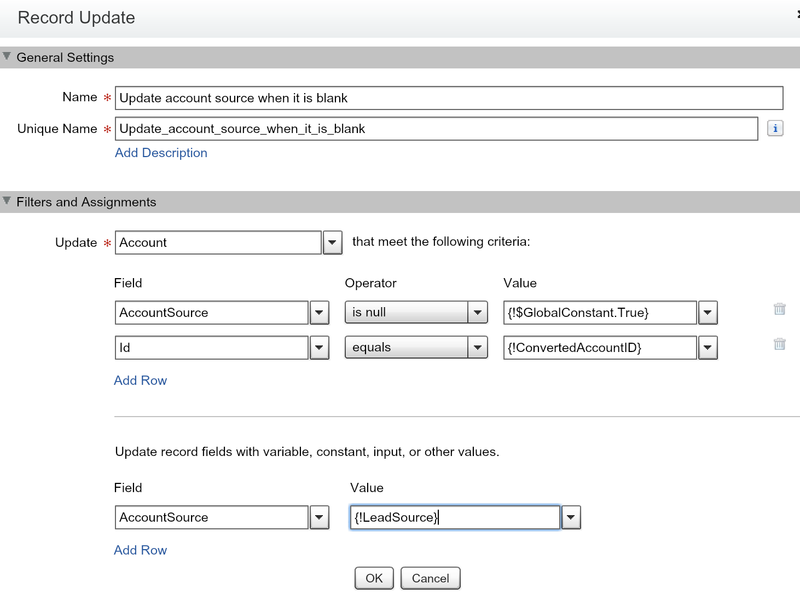 This is a great article and was very easy to implement however I’m having a problem where the account source updates when a new lead is converted and attached to an existing account. I do not want the account source to update after it’s been set. How can I do this? Thanks for your feedback Shayna! 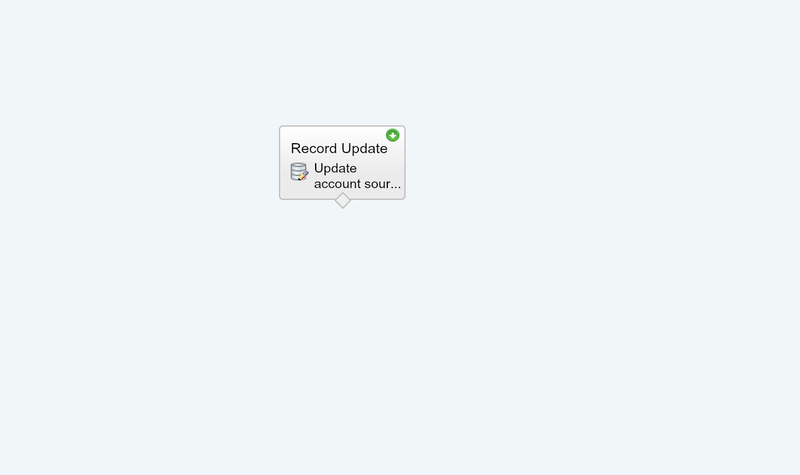 In your case, Try to add something like Account.CreatedDate=Lead.ConveretdDate, in record update filter. Last option is to move the record update and filter part in Flow. After trying so much solutions only this solution worked for me but I dont want to change the account source value when I convert lead under the existing account. Thank you very much Vipula for bringing this oversight to my attention. Can you please share the screenshot of your solution. I having the same problem where the account source updates when a new lead is converted and attached to an existing account. I just start to work with process builder. Currently I am trying to map lead source to account source when converting. Note: Pick-list has 10 Values. I have been using your article as a great help. By following the instructions in the article the process works with one value, but when trying to have several values from the pick-list its states that it will only take one of the selected values. I have tested all the possible options without luck. E.g. when adding criteria selecting choosing Any of the conditions are met (OR). Any suggestions please! When it’s time to select a record related to the lead, the Account object and it’s fields are not available to me. How did you get access to the Account fields? Lead object is not connected with Account object. After conversion you will get the Account ID. 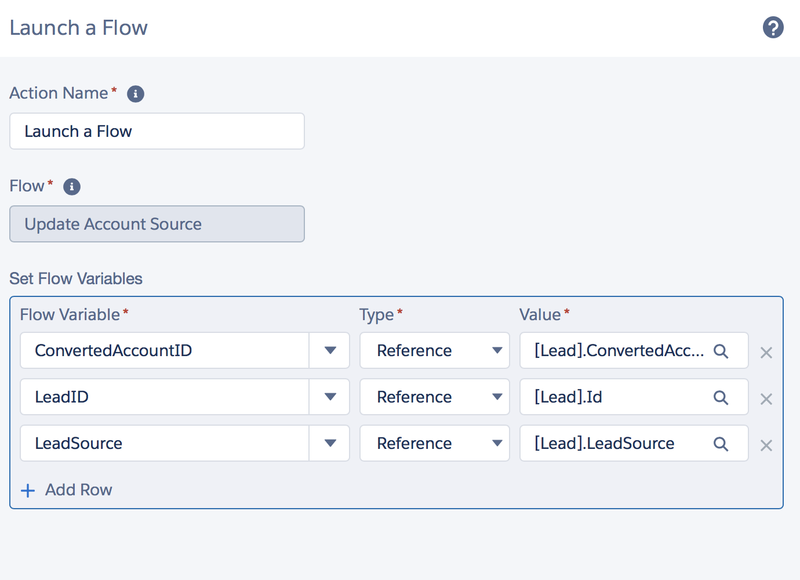 Worth noting that Setup -> Customize -> Leads -> Lead Settings -> “Require Validation for Converted Leads” MUST be checked for process builder related items to fire during conversion. Appears that this is not checked by default.